The United States steel industry faces severe headwinds as steel prices continue to fall. Even as recently imposed protectionist measures on certain imported steel products take effect, tariffs alone may be insufficient in helping steel producers recover their lost momentum. While these measures provide some support by maintaining price levels in the short-term, they fail to resolve the broader challenge in the global market: removing excess capacity. In an exclusive thought leadership newsletter, “Losing strength: US steel industry analysis”, White & Case, a pioneering global law firm, and the Boston Consulting Group, a global management consulting firm, in collaboration with Debtwire, analyze this year’s latest developments and market opportunities in the beleaguered US steel sector. 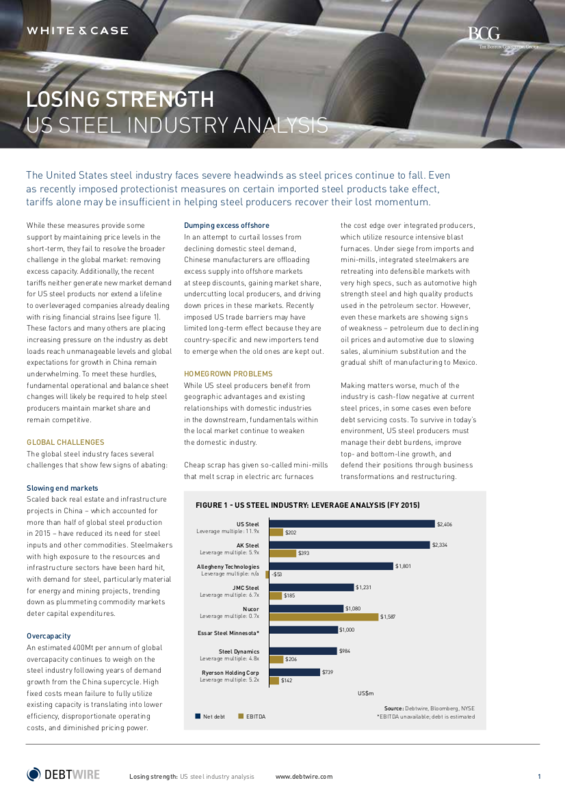 A distressed watch-list for the US steel sector, containing analysis of credit metrics and stress levels among select steelmakers, based on proprietary Debtwire intelligence. An analysis of various restructuring and recovery options for US steel producers, including the viability of asset sales. The likelihood and implications of seeking Chapter 11 protection for US steelmakers. Growth through innovation as a sustainable way forward for the US steel industry. A feature interview with White & Case industry experts John Tivey, Rebecca Campbell, Scott Greissman, and Boston Consulting Group expert Heinz Pley, presenting insights on the efficacy of recently implemented protectionist measures, the most pressing challenges and risks for the sector, as well as an industry outlook for 2017.